Do you struggle keeping 2 or more sources of data up to date with name changes, address changes, email updates, phone number changes or more? The reality is that most of us do. If you have 3, 4 or more data sources to integrate, then you know the challenge increases geometrically. If this is your donor world, Master Data Management can help. Master Data Management (MDM) is not just a technology. It is a strategy, it involves people, it has standard processes and it is also a technology. MDM is based on the premise that a nonprofit must have a single master copy of donor data or a single version of the truth. For our purposes, we talking about master donor data. There is also an enterprise approach that includes other data like finance and human resources. Departments that will be interested in this approach are development, marketing, donor service and others. Nonprofits should consider a donor MDM approach when you are large enough and have several significant donor data bases to integrate and analyze. With donor MDM, you want to create a master data file that keeps track of differences in donor data from multiple systems. As you integrate two or more donor systems, you may have addresses that don’t match for the same donor. In one case, you may have a maiden name and in the other system the current name. In one system, you may have a home address and phone number while in the other you have a work address and phone number. In one system you may have a first name of Pat and in the other Patricia. All of these differences make it extremely difficult to create and maintain a single set of master data and can throw your donor analytics out of whack. It is common to think that Master Data Management (MDM) and Data Warehousing (DW) are the same and can accomplish the same results. They are in fact remarkably different and nonprofit (non technical) staff should appreciate, at a high level, the distinctions. Nonprofit goals for creating amazing donor experiences, are at stake. Donors do not tolerate bad and duplicate data. It is a common source of complaints at call centers. Great donor journeys can be derailed because of simple donor data problems. Executives who are obsessed with donor experiences will appreciate that attention to donor data detail is critical. If staff see duplicates in a donor system like CRM, they will not tend to trust analytics in a business intelligence solution. Different Goals – The primary goal of a DW is analytical in nature. It looks at historical transactional data. The primary goal for MDM is to establish a single version of the truth for a donor from one or more donor systems. MDM requires solving the root cause of the inconsistent data, because master data needs to be propagated back to the source system in some way. In data warehousing, solving the root cause is not always needed, as it may be enough just to have a consistent view at the data warehousing level rather than having to ensure consistency at the data source level. Different types of data – MDM looks primarily at donor data but not transactional data. A DW generally looks at donor (a little) and transactional data (a lot). Different reporting needs – In MDM, the focus of reporting is more about oversight of the data, duplicates and data quality. In DW reporting is all about analyzing the data and providing insight. Where data is used – In a data warehouse, usually the only usage of this “single source of truth” is for applications that access the data warehouse directly, or applications that access systems that source their data straight from the data warehouse. Most of the time, the original data sources are not affected. In master data management, on the other hand, we often need to have a strategy to get a copy of the master data back to the source system. This poses challenges that do not exist in a data warehousing environment. For example, how do we sync the data back with the original source? Once a day? Once an hour? How do we handle cases where the data was modified as it went through the cleansing process? And how much modification do we need make do to the source system so it can use the master data? These questions represent some of the challenges MDM faces. Unfortunately, there is no easy answer to those questions, as the solution depends on a variety of factors specific to the organization, such as how many source systems there are, how easy / costly it is to modify the source system, and even how internal politics play out. Master donor data that is trusted is of huge value to your donor initiatives. The reverse of that will cripple many donor systems. If the insights gained from your analytics isn’t trusted because of duplicates and poor quality donor data, it will be hard to gain traction. Fixing that, after a CRM implementation, for example, is almost impossible. Employees will not use a system they do not trust. Management will not require a system to be used if it is perceived to have useless data. Establishing a single version of the truth, early on, is foundational to a donor focus. It is critical that clear definitions of donor data are established. Who is going to do that? A Steering Team (with a focus on strategy) should be appointed with business leaders heavily involved. At a minimum, staffing should include a data steward. If you have enough donor data, a dedicated team should be appointed. 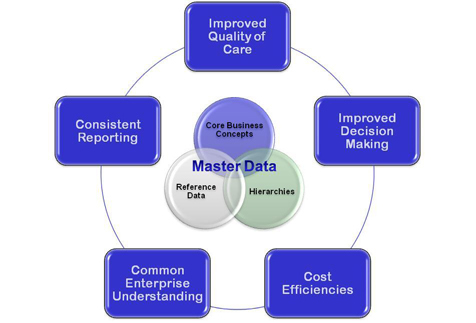 Master data management should be both a local and corporate responsibility. Many times duplicate data has to be resolved by staff who are closest to the donor. That may be at the local level. Clear timeframes for resolving conflicts should be established and enforced to make sure duplicates do not linger too long. There are some natural constraints that we face in establishing master donor data management as an important initiative. Here are 8 requirements for an effective master donor data strategy. Secure an executive sponsor early. Create a business case for why master donor data is important. Pursue an iterative approach and avoid “big bang” implementations. Plan for organizational and culture change. Understand the importance of data governance and appoint a steering team early. Establish clear metrics for success. Rely on the “right” technologies. Start by defining your goals and strategies for managing master donor data. Begin by appointing an oversight team. Encourage a culture that values quality donor data. Understand that nothing frustrates donors more than not getting the basics of donor data right. Establish quality donor data as a norm. Great insight flows from quality data. Recruit an executive sponsor “who gets it” early. Make quality data everyone’s business. Recognize the barriers and “deal” with them early.